I have been reserching coyotes and times to hunt them. In the process I have found what appears to be an indication that SE coyotes are larger and heavier bodied than the western coyote. Right now the score is coyotes 0 and Ed 1 but that coyote was a bit on the dumb side. Walked right up to the burn pile at 5:30 AM to cop him a steak bit breakfast. A neck shot at about 90 yards by the 218 Bee (only centerfire I had with me) put an end to his business. Saw another one as a flash on last Sunday morning while goind dow the back road in my Clays/Golf cart. It zipped across the road about 50 yards out, like a flash. Found it was hunting a hen turkey in the section of woods it cam from. They say the best time to hunt them around here is about daylight to 2 hours after daylight. I now have my player, recorded calls and an outdoor speaker. We are getting close to WW III on yotes. Sunrise and sunset are typically good times but check out the solunar tables. I have had good luck using that as a guide to when the yotes may be out hunting. There have been several times whenI have seen a fox or a coyote at what I thought was an odd time and checked the solunar table to find it was a peak activity time. not a guarantee of a kill every time but I have killed more in the peak times than I have in the off times. Is the fishing schedule the same as the hunting schedule and are the peak time 0 and 180 as per the other schedules? Up in the country I am not sure how I will go about getting a schedule unless the reading for one schedule covers about 60 miles. By the by, I now carry my Mini-14 on the cart and the tractor so if we get a longer look than a flash we might get #2. Check this site out. Put in the zipcode and it custom makes one for that location. Thanks for the info, that will work for fishing in the ponds as well. Take a gander at the third movie down. A coyote gets a tipie-toe wobbly dance. A long story, I built a Martini in 218 Bee, then sold it at Tulsa for $475. Left the table, walked down about 4 rows and an old fellow had a gun behind his table.. what ya got there....A #1... can I see it? So my traveling partner reaches out and takes it, looks at me and says to the guy, how much will you take. Guy says $425. Partner looks at me and says; if I hand this to you, you are going to buy it aren't you? I just grin & nod. So he hands it over. I turn it, hum, a little 218 Bee. I guess you could say I just traded a Martini for a #1 and got $50 to boot. Partner says, Oh, man, I did not even look, I have been looking for a 218 in a #1. So I just smiled and paid the man. Now every time we go to Tulsa I have to hear the story of how I did him out of the 20 year old, unfired, #1 in 218 Bee, both coming and going on the road. I feel sorry for him, but not enough to give him "my" Bee. PS It sure does like 35gr Bergers and 15 gr of H-4227. Years ago I had a Marlin .218 Bee in my hands, but put it back on the table. Money was just a little too tight at the time. I've been kicking myself ever since! 218 Bee, Would love to have one !!! My reading says that coyotes are most active at night and early morning. I've only been hunting for them twice and never saw one. I did have one sneak in about mid morning, trying to find the turkey that was making all the noise. It was me, with a turkey call. He got spooked by my partner before he got within range of our shotguns. I've heard them calling in the late evening, after dark, and also in response to an emergency vehicle's siren during the day. I have never hunted yotes but we have a large population around here. I have actually seen very few, I use my deer bones and trimmings as bait for the guys that do hunt them. They usually save them for after deer season. For the most part they run them with dogs, snowmobiles, and drivers on snowshoes. I'm not a big fan of hunting with so many people, they will get one running and surround the section with hunters. I guess I have always looked at hunting as me against the critter, whose the smarter one. Usually the critter proves to be the smarter one. I wrote a magazine article several years ago about small capacity cases and powders. For that article I did about 6 months of direct experimentation with various powders. Prior to that, I had discovered that Unique and 4227 are two powders that are just very hard to beat. You can use 4227 in just about everything from a 50 BMG to a 25 Auto. What I found was in the case capacities like the 30 Carbine, 32-20, 30-20, 25-20, 218 Bee, 22 Hornet, etc., the powder that topped out with the best accuracy and best velocity was H-4227. 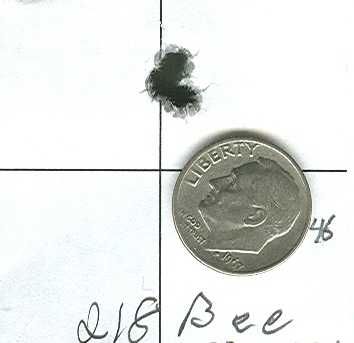 This is the 218 Bee group at 100 yards with the 35 Berger over 15 gr of H-4227. The 40 gr Nosler runs .25 to .50 with the same load at 3,215 fps. My battery died on my chrono so I am not sure about the 35's velocity, but would guess it is runing around 3,300. A small change in a small capacity case makes a big difference. My #1 barrel is compleatly free floated, with the hanger being glass beded. One thing, shooting a coyote with a 35gr bullet is not a good idea at anytime, unless it is all you have at the time, as was my case. I shot him in the neck and would have taken a head shot if he had not been looking around constantly.